On to Round 2 of Project Sewn – Floral Frenzy. Floral fashion is on trend and perfect for spring. My floral silk fabric was purchased two springs ago, at Vogue Fabrics in Chicago. Not the flagship in Evanston, but the smaller, South Loop store. On a business trip with my husband, where almost every minute was scheduled, I managed to slip away for only 30 minutes of fabric shopping. It was an quick-impulse-buy kind of visit, but I bought the floral and a coordinating silk lining. This project has been sitting under my cutting table since last fall and having a challenge created the motivation to pull it out and get to sewing. 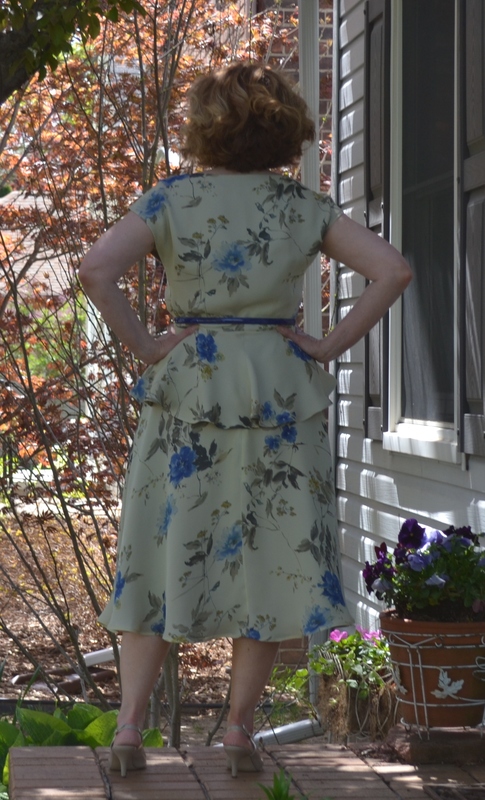 The top is Simplicity 1590, a 1940s retro pattern. I basted the lining and fashion fabric together and treated it like one fabric. The peplum is longer and fuller in the back. Some reviews mentioned needing to shorten it in back, but the drape of the fabric looked pretty, so I left it long. In a crisper fabric, it may look better shorter. The skirt is something I adapted from a pattern, but recut in a heavy weight tissue and did not mark with the original pattern name and number. I’m trying to develop better habits when it comes to notating pattern changes and adaptions. Some where between an A-line and a circle, it is enough to have swing and pretty movement when you walk. The lining is only attached at the waist and zipper, so the floaty silk moves easily. Finally, some spring weather to wear a flowery spring outfit. Thanks, there were some cute ones on Pattern Review too. Gorgeous spring pieces and you will get a lot of wear from them. Thanks, I wore it to work on Monday. No wrinkles from sitting at my desk all day was a bonus. Very pretty! I love that you’ve added the matching skirt for a full outfit in this beautiful fabric. 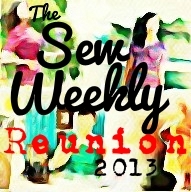 I have this pattern in my stash and yours is the first sewn version I’ve seen; wonderful work! Thank you, it is a pattern I’d make again. Maybe a crisp cotton version.